The Tektronix Type 535 is a 10*/15 MHz oscilloscope that accepts letter-series and 1-series plug-ins. There are two timebases, and triggering is done with a Schmitt trigger made of a 6U8 tube (in early instruments) or a 6DJ8 tube (in late instruments). The delaying timebase on the 535 (non-A) supports delays up to 100 milliseconds. The 535-S1 supports delays up to 1 second. The 535A supports delays up to 10 seconds. The 535 is functionally the same as a 545, but with a simpler, non-distributed vertical amplifier. Early 535s came in brown, square-cornered cabinets; in 1956 the cabinet became blue and round-cornered. Early 535s had selenium rectifiers. The 535 has a thermal cutoff. 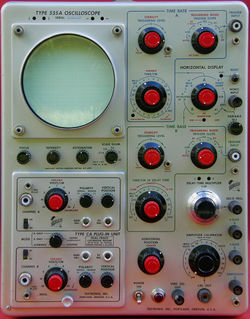 Type 535, the single-timebase Type 531, and the first four plug-ins, Types 53A, 53B, 53C, and 53D, were introduced in August 1954, advertised as "... the «convertibles» of the Tektronix line". Types 541 and 545 came out in March 1955. The 535's CRT is Tektronix part number 154-081. In 1959, Types 531, 535, 541, and 545 were superseded by Types 531A, 535A, 541A, and 545A, which have more convenient controls. In addition, Types 531A and 535A have slightly faster (15 MHz vs. 11 MHz) vertical amplifiers. There is a rack-mount version, Types RM35 and RM35A. Starting in 1963, the 535A was made with BNC connectors for the external trigger inputs. Prior to 1963, the external trigger inputs used UHF connectors. 1972 was the last year that any version of the 535 was sold. In 1973, the 54x series was still available, but nothing from the 53x series. The first 535s had brown slide-out cases, then blue slide-out cases, and finally blue cases with pop-off sides. In Type 535 and 545 the total delaying sweep time is limited to 10 ms/cm. If a total delaying sweep time in excess of 10 ms/cm is required, a K535-S1 modification kit (Tek #040-063) which gives a maximum delay sweep range of 1 s/cm. This kit is available for $40.00 in including a new front panel. * With Type A or B plug-in; 11 MHz with Type K or other fast plug-in. 108/115/122/216/244 VAC ±10%,selected via primary voltage selector and voltage range selector switches, 50 Hz to 60 Hz. The 535's power supply provides regulated outputs of −150V, +100V, +225V, +350V, +500V as well as a +325 V unregulated output for CRT HV section. This page was last edited on 2 February 2019, at 12:34.